What is Lamb Chop Dog Toy? Squeeze the Lamb Chop™ Dog Toy, and watch your dog's instant excitement. Your dog's ears will perk up at the sound of the squeaking. Toss the toy to your dog and let the fun begin. 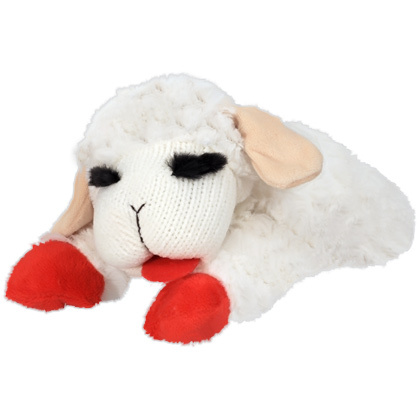 Whether your dog likes to cuddle with toys or romp and play with them, the Lamb Chop™ Dog Toy is certain to please. If the toy gets damaged or the seams are torn, you should throw it away immediately. The plastic squeaker inside can be harmful if inhaled or swallowed. Do not let your pet play with a toy that is broken or damaged. The Lamb Chop™ Dog Toy is for dogs only and has not been approved as a children's toy. Please keep out of reach of children. Always supervise when your pet is playing with toys. If the Lamb Chop™ Dog Toy tears or the seams are damaged or opened, you should discard it immediately. Give to your dog as a toy. Polyester Fibers, Plastic Squeaker (inside the body).